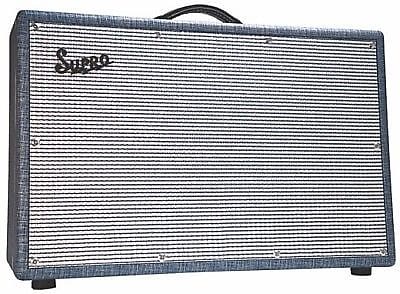 The 1688T Big Star is the largest and most aggressive Supro 1964 Reissue amplifier. This all-tube luxury 2x12 combines the instantly recognizable tone of the Supro Class-A power amp with a pair of custom 12” drivers housed in a wide-body, vintage correct cabinet to create a larger-than-life guitar sound at a functional gigging volume. This historic amplifier’s cathode biased, Class-A power section provides whisper-quiet, low-noise performance with exceptional touch dynamics and generous amounts of power tube saturation. 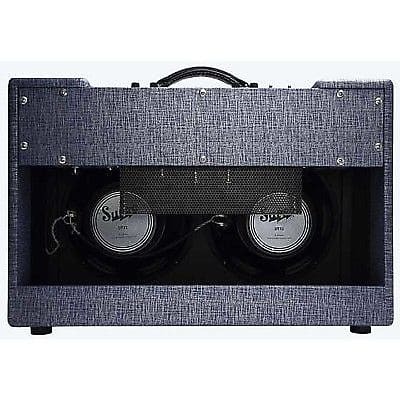 The unique Supro power amp allows players to run this rig at full volume on stage or in the studio, while using their hands to control the texture of the sound. The 1688T Big Star provides a huge variety of classic tones ranging from warm jazz to dirty blues and high-gain rock simply by adjusting your guitar’s volume knob. This is a bona-fine Supro reissue, designed by Bruce Zinky & Thomas Elliot and hand-assembled in Long Island, USA. Dimensions: 27.8 in. x 18 in. x 10.5 in. Based on purchase price of $999.99 at 10% APR for 12 months. Excludes tax and shipping fees, to be calculated at checkout. Rates range from 10-30% APR. Choose from 3, 6, or 12 monthly payments.